The Cessna 185 Skywagon has no bad habits. Nothing about it is going to reach out and surprise you. It has proven itself for over 50 years and will continue to be restored, repaired as required and flown for another half century. We’re not sure any other airplane quite matches the Cessna 185 Skywagon’s ability to lift its own weight, haul loads in and out of short, unimproved runways, cruise at around 130 knots, and provide a stable platform in IMC and gusty winds aloft. Cessna 185s are like the rural contractor’s beloved Ford F-150 V-8: rugged, powerful, and trusted. With power to spare and two cabin doors, you can fill it full of ski or fishing equipment, hunters, or lumber. It’s also a highly sought-after floatplane. My name is Steve Durtschi. If you are reading this, I suspect that you are a lot like me. I have been dreaming, sketching, and otherwise thinking about airplanes ever since I can remember. I built a B-17 out of boxes in my bedroom and flew many more than the mandatory 20 missions. I once set our neighbor’s house on fire when my miniature hot air balloon, built from magazine plans and fueled by dryer lint soaked in alcohol, failed to gain altitude. (I still can’t believe my parents actually watched with glowing approval the back yard inaugural launch, probably commenting that their gangly son was such an obvious genius). I vividly remember my first actual gas model engine—a Cox 049 “Babe Bee.” I must have turned its little plastic propeller over a thousand times after taking it out of the box, each time feeling that satisfying “bump” as it came up on compression. Over the years, the little engine would power a small fleet of models and countless happy times. I learned to fly in 1984. A few years before that, I hauled the bits and pieces of an Aeronca “Chief” home on a trailer from northern Montana. Over a period of about three years, I re-built it in the garage. At one point I made one spruce truss rib every night for 32 nights before reassembling the wings. I “pushed” the butyrate dope—applying it too quickly between coats on the fuselage. It looked awful. In frustration, I ripped all of the newly applied fabric off and started over. I retained the services of a local flight instructor daring enough to fly the thing with me. The “Chief” had 65 HP and an old tattered wooden prop. I thought it was the ultimate in high performance. Looking through my log books now I see an entry that reads, “Climbed to 7,500 feet” (with two exclamation points). Over the years, I have been privileged to accumulate about 3,800 hours of flying time and earned a CFI certificate along the way. Nothing like the professionals, but more than some hobbyists I suppose. I have been much more fortunate than most pilots, as I was taught by unique and consummate aviators. Now, I’m sure that the world contains many fine pilots, but my mentors surely were some of the best. These were pilots who made their living flying in the mountains or low level in ag planes. I have had a running argument with an aviator friend that there is only one best way to do any particular maneuver in an airplane because that is how I was taught. (Watch the birds. They all do the same thing like approaching and perching on a pole the same way). These guys taught you to do it their way, period. No discussion. They were hard task masters, rarely praising a job well done. “Now, Buckwheat (everybody was “Buckwheat” – don’t read anything into that one). . . that bounce doesn’t matter! The only thing that matters is what you do after the bounce”. In those 3,800 hours I have never scratched an airplane, or honestly never silently declared, “I’ll never do that again”. Their lessons have served me well over the years. My non-aviator friends declare that I must be rich as I own an airplane. Some owners may fall into that category, but not me. How much does it cost to own an airplane? The answer for me is easy—everything. I am 64 and we still watch a 70s vintage television. We just bought our second couch in 25 years. My Toyota pickup now has 285,000 miles. But heck, who cares. We can go anywhere in the airplane. I would not have it any other way. My Aeronca Chief gave way to a Stearman restoration project. The Stearman was eventually sold to acquire a Cessna L-19 “Birddog” which introduced me to the mountains and backcountry flying. My love affair with the Cessna 185 Skywagon begins with words from a favorite author, Richard Bach. Bach declared that nothing happens to us by chance—everything has a reason.1 A United pilot friend called one day and began telling me about a copilot he flew with who owned a Cessna 185 Skywagon. 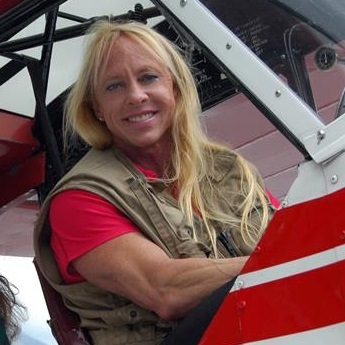 The owner had disassembled the airplane after rodents literally ate the interior during a severe winter. My friend went on to say that he had the strangest feeling that this was to be my airplane. I told him I was perfectly happy with the Birddog and had no reason to own anything else. He pleaded with me to at least call the owner and I agreed. That first call ended in a curt “that is my airplane and please don’t bother me again” from the owner. Just as well. The 185 worked on me over the next six months and one night, just out of curiosity mind you, I called again. This time, the conversation was friendly, but neither of us actually talked about selling or buying the Skywagon. I did tell him that if that day ever came, I thought I could offer it a good home. And that was that. I tried to put the 185 out of my mind, but now I was hooked. A few months later, the owner called me—he wanted to buy a center pivot for his beet farm and had decided to finance it with his old Cessna 185 Skywagon. I could have it if I wanted it. The Birddog went to a fine new home in Montana. My wife and I brought the 185 home in the back of my truck and a moving van. Virtually nothing was still attached to the airframe, but all of the pieces were carefully labeled and packed in boxes. Over the next year, we put it back together, replacing parts as required. My new 185 was an E model, manufactured in 1969. It still had the original red paint trim from the factory, now faded to orange. The rest of the airplane was bare metal. (I have been told that only the nicest factory airplanes with the least sheet metal flaws were hand-selected from the production line to receive trim paint only. I don’t know if this is true and I have not tried to verify it because I’d like to believe it is). The plaid seats were pure 70s and hilarious. The airplane was never operated as a “Part 135 Charter,” which most were, and as such is pristine with only a few thousand hours of flying time. It had a factory camera port and all of the “extras” of the era such as stowable rudder pedals, fully adjusting seats and rudder trim. There are truly magic carpets in this world because I own one. For 20 years now, the 185 has been our view of the world. We have camped on most of the Idaho wilderness landing strips. We have rolled our wheels on the volcanic ash in the “Valley of Ten Thousand Smokes” in Katmai National Park and the beaches of Montague Island near Cordova, Alaska. The airplane has also transported us to caress the Gray Whales of Baja. From under the wing, we watched a beautiful black fox with a snow white tip on her tail stalk and catch a gopher. We have listened to the wolves howl and watched the Salmon complete their life cycle, and done, as they say, a hundred things you have not dreamed. But most and best of all, we have made some amazing friends along the way. There is something about the camaraderie between aviators that transcends all other activities. Most interaction between us humans require at least a rudimentary investigation into background and a little time to germinate and grow a relationship, but not aviation. Taxi up next to an airplane tied down by another camper and you are instant friends. No one cares whether you are a king or a president or a street sweeper. You are a pilot and that is all the introduction required. As we move on to the nuts and bolts of flying the Cessna 185 Skywagon, if you have remained with me thus far dear reader, I must apologize for I fear I am now about to offend a good share of my 180/185 brethren. Let’s get the worst over with first: after flying the 180/185 models now for over 20 years and having the good fortune to fly many of each and about all the mods available, let me categorically say that I loathe any and every so-called aerodynamic enhancement. STOL kits, vortex generators, flap gap seals, extended wings, droop wing tips (OH PLEASE, NO!) etc., etc. will serve one and only one purpose and that will be to slow the airplane down. Sure, aftermarket engineers and their mods can reduce the stall speed by a knot or two and allow the airplane to fly “deeper into the stall” (never quite figured out what that one means), but in the end, you will simply cruise slower making tiny low-speed improvements meaningless. Some mods are downright dangerous – like drooping the ailerons with the flaps. Sounds like a great idea, right? The problem is it’s been tried from WWII to the present, always with the same results—that is a loss of aileron control at low speed. Give the Cessna engineers the credit they deserve and leave that beautiful wing alone. It was perfectly designed and tested and cannot be improved. There are, however, a few mods to the airplane that are beneficial if not almost mandatory. Tail pull handles manufactured by BAS are marvelous. They provide a stable and powerful handle to move the airplane around and keep one from pushing on the stabilizer. (You never do that, right? If you saw the tiny one-quarter-inch bolts attaching the stab to those even more dainty jack screws, you might not ever fly the thing again, let alone push on it to move the airplane). The V-brace adds strength to the cabin and carry through structure. Grab your friend’s 185 out at the strut attachment without the brace and bounce it up and down. Hear that screech in the windshield? Something is moving just a bit in there. Now do the same to your airplane with the V-brace. It is solid as a rock. Seaplane steps and handles just forward of the windshield are also a must. Now you can jump up there and fuel the airplane yourself. Easy to check the caps, too and clean the windshield. The seaplane muffler adds a few extra inches to the exhaust and keeps the belly much cleaner. Never bolt an extension to a regular muffler. The extra moment arm will eventually crack the non-reinforced stack and it may break off, which will burn your cowling up and maybe the airplane. The “Door Stewards” are a great idea. I wish I would have thought of that one. They will hold the door open when you want it and help prevent it from banging and dinging the strut if the door gets away from you in the wind. The landing gear beef-up blocks marketed by P. Ponk were popular once, but seem to have faded now for some reason. The gear legs on the 180/185 are a weak link on the airplane. The leg is held in place by one (admittedly pretty large) bolt. The gear legs work great as designed, but will tolerate very little side load (like bouncing sideways in a stiff wind). As the airplane moves sideways, the gear leg can literally pry the head off of the bolt and then depart the airplane. This often totals the airplane as the repair is significant. The P. Ponk blocks reinforce the bolt, but it seems now some operators believe they are not necessary. I suppose the key is keeping the darn thing straight all the time. The tail spring carry through is an area that deserves special attention. The rubber bushings in the steel rod dry out and play develops in the spring. The problem is with the weight on the tail wheel it is difficult to detect the play. Jack the tail off of the ground at every annual and grab the tail spring, wiggling it up and down. Any play will be evident. The bushings are easy to replace. Finally, you do have shoulder harnesses, don’t you? The Continental IO-520D engine in the 185 is simply marvelous. It is non-icing and has an excellent record of reliability. However, this engine must be managed properly or it will disappoint you. I rarely look at the overhaul costs anymore as you could buy a nice car instead, so run it the way it should be run for the most life. I believe the 185 might be the only application of the 520 allowed to run to 2,850 RPM for takeoff, generating 300 HP. This is a 5-minute limit and the resulting howl is pure unadulterated non-diluted industrial strength maximum combat overdose airplane noise. Especially with the huge 86 inch seaplane prop that many still have. DO NOT use lower RPM for takeoff believing you are being kind to the neighbors. This compromises your safety and that of your passengers. If the neighbors don’t like it, they can move away and buy a boat. Bring the RPM back to 2,500 as soon as you are safely off the ground and climbing. This will reduce the noise significantly and please the neighbors. The engine has an 1,800-hour recommended TBO (time between overhauls). The cylinders seem to rarely make it that long (more about that in a minute). The engine is relatively AD free – case cracking and older non-VAR (vacuum air melt) crankshafts being the most problematic. The older cranks are non-air worthy if the case is disassembled for any reason and must be replaced. Many new owners struggle with starting the 520. Cold starts are easy. Boost it for a few seconds and hit the starter; it will start right up. Keep the idle low until the oil pressure rises, especially if it is cold. Pre-heat the engine below about freezing temps. “Hot” starts seem to separate the men from the boys. There are a million techniques. Forget about flooding it and then starting with the mixture at idle cut-off, or circulating the fuel through the system with the boost pump (the former must be the ultimate in multi-tasking and the latter is asking for a fire as fuel can leak by the fuel control unit and into the intake and air box. Go ahead; ask me how I know….) If you do it my way, I guarantee success (see my treatise on how I was taught above. Like Dizzy Dean said, “It ain’t bragging if you can do it”). Boost it for just a second or two and no more. Just make the fuel flow needle wiggle off of the peg. Now engage the starter and simultaneously bring the throttle in. Relax, it takes a minute. Just keep moving the throttle—slowly. When you reach a fuel/air mixture that the engine likes it will start. If it starts to die, hit the boost pump for a second or two and it will come back to life. My IO-520D has never let me down. On the hottest summer days, it starts every time and I never worry about it potentially stranding me. Until you master the technique, (you will with time) if the engine fails to start hot after a few tries, bite the bullet and walk away. It may be flooded and to continue trying is risking an induction fire. Let the thing think about it for 30 minutes and sort everything out. It will start right up when you get back. The cylinders and specifically the exhaust valve is the real only weakness of the 520. Heat is the issue and burned exhaust valves are probably the cause for most cylinder replacements. The 6-probe CHT/EGT is the biggest breakthrough here and every 520 should have one. Now you can really monitor things. Keep the CHTs as low as possible. Reduce the power, keep the cowl flaps open, richen the mixture. Do whatever it takes to keep the CHTs from getting too hot. I could contribute nothing by adding my 2 cents to the barrels of ink that have been spilled debating the lean/rich of peak issue other than to say read all you can and understand this process of combustion thoroughly if you want to own and operate this engine. The injected 520 seems to run fine lean of peak. That’s what the data says. I believe the data and the curves. Problem is, that’s not how I was taught and I run my engine 50 to 75 degrees rich of peak. As a student, I remember trembling as my instructor would run his finger inside the exhaust stack after a flight. . . “Buckwheat, do you see this! That’s too light. You are runnin’ this engine too lean. I want that smudge to be light tan”. That’s how they did it then and their engines always made TBO. It’s good enough for me. My engine now has 1,200 hours and still running on the original cylinders. My airplane does not have the long range tanks: 60 versus 84 gallons. This is fine with me as it is just too tempting to fill the tanks everywhere one goes and my experience has been that you end up lugging around all that fuel when it’s not really needed. After two Alaskan trips and many forays to Baja in Mexico, we have done just fine with the small tanks. They may require a little extra planning and maybe a fuel stop but the weight savings are well worth it. I believe I am as conservative at it comes when flying the 185 in the backcountry. Published backcountry landing strips are airports, usually with ample runways, which is fine with me. Except for maybe a lake bed or two and a few locations in Alaska where we had good information that pilots landed there routinely, I do not take the airplane “off airport”. I’ll leave that to the Cub guys. I have nothing to prove and no burning desire to be able to say I’ve landed at Mile Hi, which I have not. I accept the no go-around runways as a manageable risk and for these type environments will attempt a landing only in the calmest of conditions. 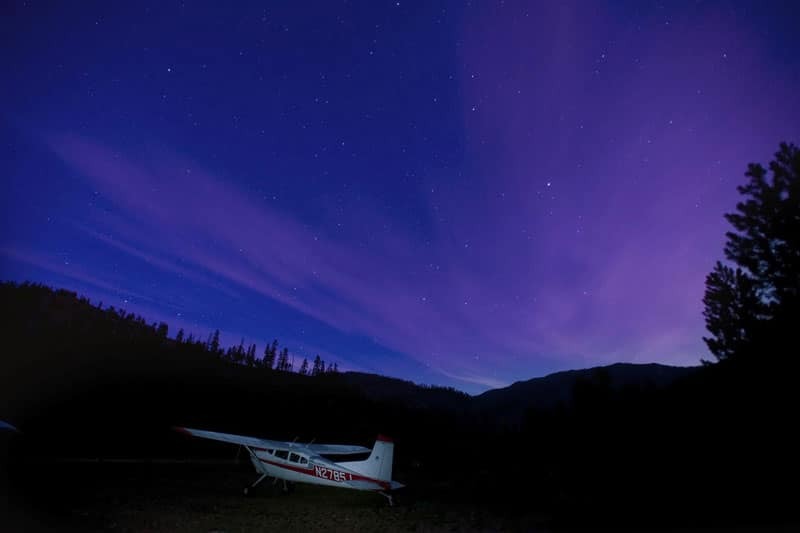 We love nothing more than that early daytime flight and make it a habit to be on the ground by mid-morning. A primer on tail wheel flying is beyond the scope of this article, but I might offer a few tips I have learned on flying the 185. Wolfgang Langewische in his famous book Stick and Rudder2 makes a strong point in the first chapter that it is not possible to teach oneself how to fly an airplane. Humans are two-dimensional creatures and have no intuitive feel for the air as do birds. We learn rapidly though under a competent teacher which is why we can master the air like we do. Likewise, I believe it is impossible for a experienced tricycle gear pilot to teach himself to fly an airplane equipped with a tail wheel. Tail wheel airplanes are not difficult, they are just different and it requires a new level of training to master one. There is no substitute for a competent instructor. The 185 is an easy tail wheel airplane to fly—and then it is not. I submit that it is a thoroughbred. A thundering racehorse trained and honed to a razor edge. A racehorse would be described as easy to run by an experienced jockey. But switching from the Old Grey Mare (AKA Aeronca or J3) to Seabiscuit is a little daunting. The airplane has more control than you will need. The rudder feels like power steering and moving it garners an instant response. On the other hand, “things” happen very fast and the pilot must be prepared. Those who insist on pushing the tail up rapidly with the elevator on the takeoff roll can find that 300 HP gyroscope up front responding to the laws of physics by rotating smartly to the left, requiring instantaneous application of full right rudder to counter the swerve. Bring the power in slowly (here we go again . . . “Buckwheat, don’t move anything in this airplane faster than the second hand on your watch”). With the power full forward, allow the tail to become light and HOLD that pitch attitude with the tail wheel one inch off of the ground. The rudder is not “pressed” one way or the other. It is aggressively stabbed. Stab the rudder and as the side motion begins to stop, it is immediately centered. If you push and wait for a reaction, by the time you see and feel it, the airplane will be departing the opposite side of the runway. After a while controlling it with the rudder will be second nature and you will think which way it should go and it will obey. We are rapidly moving down the runway now. DO NOT look at the airspeed indicator. All of your earthly ability is concentrated on keeping it straight. Let the airplane fly off in that tail-low attitude. Now, glance at the airspeed indicator, slightly reducing the back pressure to accelerate to Vy. Nothing is more majestic. You have extracted all of the performance possible from the airplane. Charles Lindbergh could not have done it better. You can’t rest as this horse is running hell-bent. Bring the flaps up. They are doing you no good now. Reduce the manifold pressure to the top of the green and then the RPM to 2,500. You are climbing at METO (maximum except take off) power and can divert your attention for a bit to verify oil pressure and maybe EGTs are normal. Do not look at any one thing, instrument, radio or whatever for more than three seconds before going back to flying the airplane. And now Mr. and Mrs. Reader, I know what you are planning. As we talk about landings, you are laying a trap for me to get mired down like the old John Deere in a wet field over the topic of wheel versus three point landings. The fact of the matter is the Cessna 185 Skywagon responds perfectly well to either and new pilots should master both during their training. The one thing I observe with new tail wheel pilots when learning wheel landings is that they sometimes approach the runway and round out with the nose a little high and then search for that perfect touch down on the mains. This technique is nigh impossible. With the nose high and the airplane decelerating, it is very difficult to roll it on the mains. A bounce is inevitable. The wheel landing is accomplished by literally flying the airplane onto (or, if you prefer, into) the ground. Very little round out is required. Carry some power. Find your spot and plant the thing right there. Push a little forward yoke to hold it and you can apply firm braking. It has no tendency to nose over. It seems counter-intuitive and it is, but it works and the airplane will neither crash nor bounce. I prefer this method over all others as you have greater control and the airplane is landed on your terms rather than its own after rounding out nose high and waiting for all three wheels to touch the ground while simultaneously stalling. The 185 is a “trim” airplane. Unlike its cousin the 182, that stabilizer mounted on jack screws renders the airplane capable of being trimmed at all loadings and CG locations. At the most forward CG, it can be trimmed to approach at the lowest speed completely hands off. (Try that with the 182). Every power change is a trim change and if you are not constantly reaching down to turn that powerful trim wheel during the approach, you are not flying it correctly. The 185 can easily haul four adults on cross country trips. 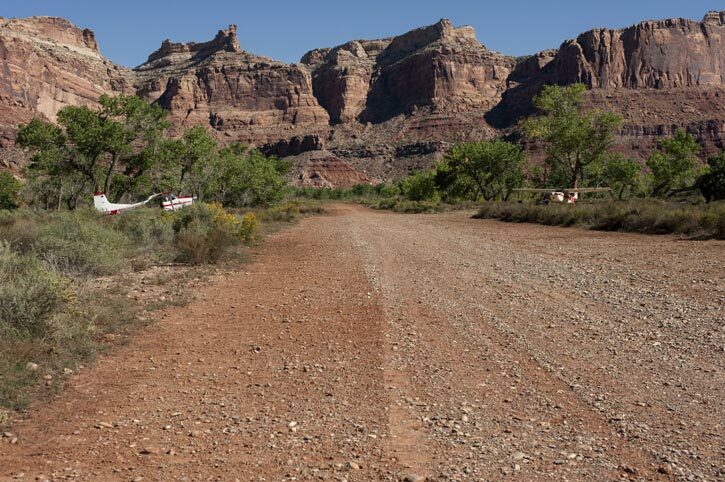 However, in the backcountry, except for long, wide-open landing strips like Smiley Creek, I make it a point to take only three and camping gear. It has a very wide loading CG range and the extended baggage aft of the rear seat baggage area is nice. All of the 185s have this feature and 180s without it from the factory can be modified with the floor and bulkhead through several STCs. Well, there you have it. This is one unique airplane. Standing as it does on its long stiff legs with that perfectly proportioned squared off vertical tail it is about as handsome an airplane as there is. The spring on the baggage door latch is prone to breaking, so it’s best to ask passengers not to touch it, and allow the pilot to load and unload the airplane. Once it breaks, some pilots resort to duct tape, but that’s an unapproved temporary solution and won’t pass inspection. Cessna won’t sell a replacement spring but only the complete latch, which comes in at around $2,000. However, a replacement spring kit is currently available on eBay for $50. 1 – By the way, if you are an aviator, but have not read Bach’s books consider yourself unfit for further flight until you have. Start with Stranger to the Ground. Proceed to Biplane, Illusions, and Nothing by Chance in that order. You may bypass Bach’s most popular book, Jonathan Livingston Seagull. Bach must have needed a few bucks to buy a new airplane when he wrote that one as I found it kind of silly. (Nobody is perfect, even hero authors). The others I have listed will forever change the way you view aviation. I guarantee it. 2 – You have not read Stick and Rudder!? Immediately suspend Bach for just a bit and carefully and thoroughly read this book. Langewiesche was a test pilot for Vought during WWII, flying the F4U Corsair. 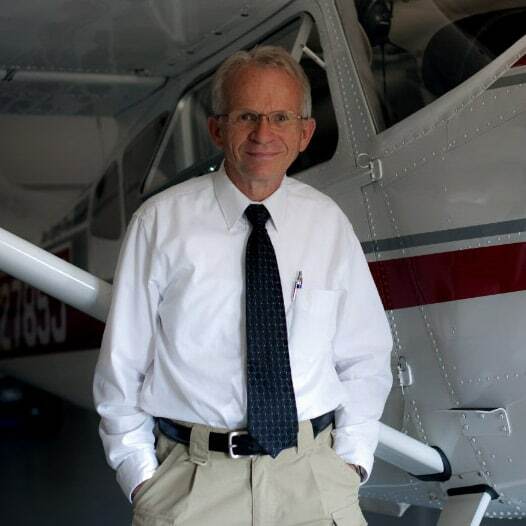 His book is the explanation of the art and science of flying an airplane. It has become a classic and nothing has eclipsed it since its first introduction. You will be surprised at what you learn. 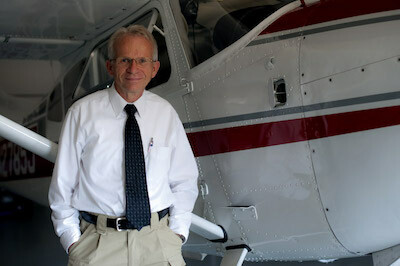 As alluded to above, John Kounis, my late Editor at Pilot Getaways magazine, owned a 1980 Cessna A185F. He had hired me to write and edit for the magazine, but we hadn’t actually met in person when he invited me along on an air-to-air photo shoot and told me I should fly his plane on the way to the shoot. I’d never flown a taildragger so he sent me a one-paragraph explanation of how to take off and land his plane (as if that would suffice!). I met John and his brother George (the photographer and Publisher) at their El Monte hangar at 4 a.m. and John immediately motioned me into the left seat. Before I knew it he had the engine started and we were off. Taxiing an unfamiliar taildragger at an unfamiliar airport at night will get your attention, especially when you’re short-waisted and strain to see over the glareshield normally anyway. As the tail lifted on the takeoff roll I feared we would strike the prop, but John laughed and said we were fine; that was a normal feeling for a first-timer. Once aloft, I found that the 185 felt about the same as a Cessna 206, which itself just feels like a slower, lumbering 210 (the aircraft my husband and I owned at the time). As we descended to our destination John simply gave me an approach speed, I hit it, and made a perfect landing that felt pretty normal to me until the tail came down. However, I flew his airplane perhaps ten other times, and the first landing was by far the best! Must have been beginner’s luck. I found that if I carried even a couple of knots extra on final, the plane would really float. And then I’d have to watch it or we’d bounce. Several times John, in the right seat, had to rescue my lousy landings. A full stall landing required me to pull the yoke all the way back into my lap. And you can’t stomp on the brakes or you may ground-loop it. Basically, compared to the C-210, you are simply a more active pilot whenever you operate this airplane on or near the ground. You can’t have lazy feet or hands. During takeoffs with a crosswind from left to right I would have to almost stand on the right rudder to keep the plane pointed straight ahead. I had nowhere near enough time in it to feel anywhere near comfortable on takeoffs or landings, but that wasn’t the airplane’s fault! 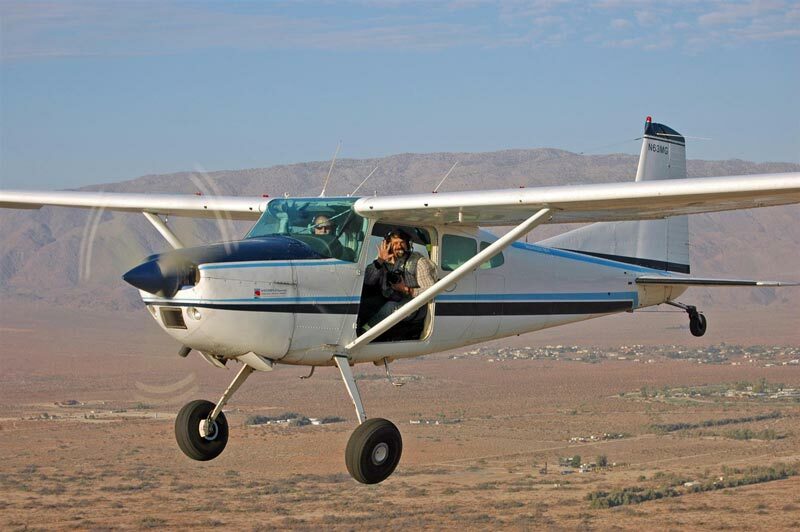 The locking tailwheel helps keep the plane straight for both takeoffs and landings, but be sure it’s unlocked before turning on the ground or you can mess up the tires. The Johnson bar is also a surprise for someone used to a simple electrical tab. In a big, heavy airplane like the 185 (and this airplane had a STOL kit) when you put in the second or third notch of flaps you have to pull on it a bit because of the wind resistance. Also, I wasn’t a fan of having to put my head down as I reached for the bar. However, I am sure you get used to that with regular flights. On super-windy days when John would land, he had me immediately retract the flaps on touchdown to kill the lift and keep the airplane on the ground, which I also always did when alone in our 210. However, due to the Johnson bar, it’s not a good idea to do that when you are alone in the 185. You don’t want your head down, even momentarily, in the 185 on the landing rollout in tricky winds. Photo by Crista Worthy; George Kounis preparing to take photos over the Anza-Borrego desert in CA. 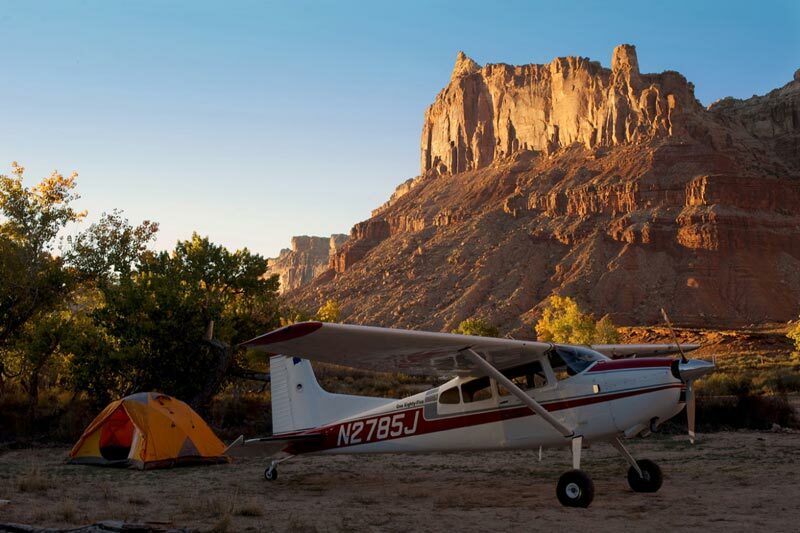 I loved our Cessna 210 (and the 210 has a wider cabin than the 185), but on several long flights in the Skywagon, for example from southern California to Wyoming, Utah, Nevada, and back, I discovered some of the advantages to the 185. For instance, both doors were attached with quick-release cotter pins so either door could be removed for photo shoots. We had one shoot scheduled at Boulder, Utah, an airstrip at 6,787 feet elevation, with only about 1,600 feet of usable length. I certainly wasn’t landing this one but as John approached the strip he said, “Let’s just check out the surface first, to be sure it’s not too soft.” So he flew down and ran the main wheels along the strip, to literally feel it—“dragging the strip”—the first time I had observed this done. You can’t do that with a nosewheel! Even with the weight of three adults and lots of photo gear, operating at this strip was no problem. The flaps were cranked down to 40 degrees, the approach speed to 55 knots, and we had almost half the runway remaining, even at that altitude at near noon. The following day at nearby Bryce Canyon, the AWOS reported the wind at 50 knots, right down the runway. Again John took the left seat and simply muscled the airplane onto the taxiway and downwind. After the very short takeoff and climbout I asked him what his no-crosswind wind limit was for takeoff or landing and he said, “The stall speed.” Then he told me to fly and after several minutes noticed I had a death grip on the yoke (remember, it was quite windy and a bit bumpy). He told me to let go of the yoke completely and fly only with my feet, which I did for half an hour. That’s when I learned how stable a 185 is at cruise. The wind might buffet it for a moment, but it goes right back to where it was, even hands-off. Because the 185 cruises at a slower speed than the 210, any given headwind negates a larger proportion of the 185’s airspeed. Thus, on longer trips, it was more important to find an altitude with less of a headwind, so as not to lose too much groundspeed. One day as I taxied the 185 in a circle around the fuel pumps at the airport, John suddenly urged me to slow down. After we stopped in front of the pump, he explained that the airplane could swap ends in an instant, and that I was going too fast. So you have to be more careful with it on the ground than with a nosewheel like the 210. My short time in the 185 taught me that it’s a wonderfully versatile and useful airplane, especially in the backcountry, which is my favorite place to fly. But you’ve got to be on top of your game to fly it for a lifetime and never ground-loop it! Cessna sold a ton of taildraggers after WWII, and the C-185 was introduced in 1961 as a successor to the popular C-180. Like the C-182, the 180 had a 230 HP engine. More power is always a plus in the backcountry, so the first C-185 came with the 260-HP Continental IO-470F engine. 84-gallon fuel tanks were included to house the extra fuel necessary, and Cessna now had an airplane with a useful load of 1,680 pounds, about 200 pounds more than its standard empty weight. Unlike the nosewheel Cessnas, it retained its straight tail, to the further joy of bush pilots who prefer added rudder authority over good looks. Although billed as a six-seater with three rows of seats, the back seat was really only appropriate for a child. Most people removed the back seat. In 1964, Cessna added the 300-HP Continental IO-520D engine as an option. These Skywagons are called A185s, and traded a measly 10-pound empty weight increase for a significant 150-pound gross weight increase. That was good for an extra five knots at cruise and 200-foot shorter takeoff run and proved so popular that the engine became standard equipment in 1967. 1973 saw the introduction of a new cuffed leading edge wing profile as part of a Robertson STOL kit (we had this on our Cessna 210). Aircraft with this wing, which constitutes over half the 185 fleet, are called A185F. The kit improved roll control at slow speeds, lowered the stall speed, and is retrofittable to earlier models. Starting in 1975, Cessna reduced fuel capacity to 74 gallons which shortened the airplane’s range. Lift handles near the tail allowed the aircraft to be moved on the ground without stressing the horizontal stabilizer. The flap-extension speed was raised to 120 knots and the fuel selector changed to the left–right–both type. Three-blade props became optional in 1978, standard in 1980, and are retrofittable. In 1979, Cessna corrected the fuel capacity decrease by changing to a new wet-wing system that held 88 gallons (84 usable). Bladder-style tanks remained optional. When the recession hit in 1980–81, sales began to slip. Between 1979 and 1985 inflation took the price of a new Skywagon from around $55K to $108K, and sales dropped 90%. 1985 was the last year of production. Load a C-185 with four 220-pound people, 50 pounds of bags, fill the tanks, and it can still take off in 800 feet, climb at over 1,000 FPM and fly 800 miles at around 140 knots. What more could you ask for? A lot, apparently. From the beginning, you could order a new 185 with Edo floats, an enormous belly cargo pod with a 300-pound carrying capacity, flip-up doors for skydiving ops, towing set-up, a spray-application rig, and other mods. Clearly, the 185 was earmarked for accomplishing tasks, not just making $100 hamburger runs. More work-related mods were offered in 1975, including skylights and the bubble windows that are coveted by photographers. The Robertson STOL kit, with its “camber lift” wing is popular among bush pilots and helpful for float planes. STOL kits are currently available from Horton and Sierra. Vortex generators also help STOL characteristics; try Micro Aerodynamics. A speed demon the Skywagon ain’t, but the turbonormalizer John mentioned can bump cruise speeds up to 165–175 knots at FL20 while burning 14.5 GPH, according to Tornado Alley Turbos. Auxiliary tanks and improved fuel systems can be had through Monarch Air and Development, Flint Aero, and O&N, or just ask your mechanic. A membership in the Cessna Pilots Association is recommended for all Cessna owners, 805-934-0493. The Cessna 180/185 Club holds fly-outs almost every weekend, spring through fall, and is a great way to meet other Skywagon owners. 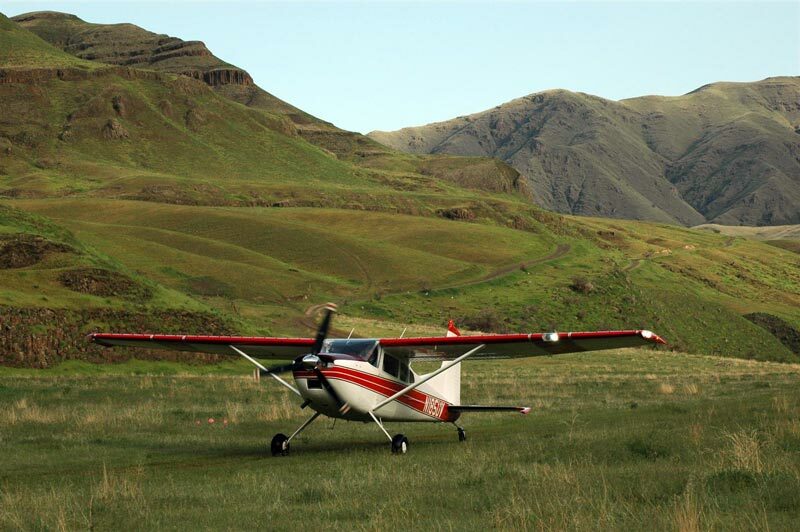 Photo by Crista Worthy; Stan Clark landing at Dug Bar, Oregon, Hells Canyon. Steve recently retired from an aerospace company where he worked on solid rocket motors supporting the Space Shuttle. He now works as the volunteer manager of his local airport and enjoys flying his Cessna 185 in the back country. Very nice article on the second best Cessna ever made (after the early C180 models of course). The one reason the PPonk kits are no longer “in vogue” is that they may save a gear leg departure but once they do let go the amount of energy released causes very substantial damage to the front ‘horse collar’ and the centre gear structure. Usually the amount of damage caused will write off the aircraft. Wings are easy to rebuild and don’t require a lot of special fabricated parts so I would rather repair a wing than a fuselage. I agree with your comment on STOL kits, I think the early Cessna wing is almost perfect as it is. Sometimes you want a wing to stop flying!